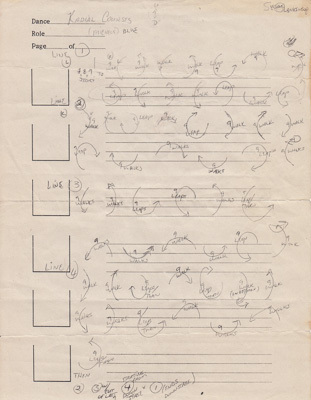 Radial Courses premiered in January 1976 at Washington Square Methodist Church in New York City. 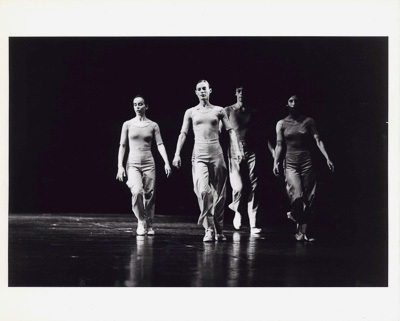 It was revived several times and was performed as part of the program for Lucinda Childs Dance Company’s 25th anniversary tour: “Parcours,” a collection of new and reconstructed works. Radial Courses in performance, Wednesday, December 16, 2009, at the Bessie Schönberg Dance Theater - PAC, Sarah Lawrence College, Bronxville, NY. 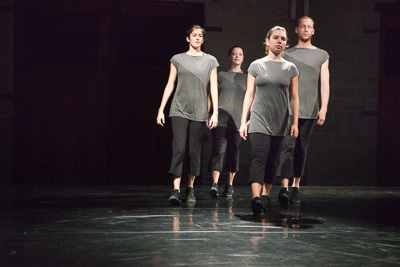 Sarah Lawrence College dancers: Ilona Bito, Nick Feder, Teresa Fellion, and Kay Ottinger. The quartet Radial Courses follows the path of a circle, where the three movement phrases (one walking and two skip-hops) are measured by the geometry of the circle, traversing either halfway or three-quarters around the perimeter. 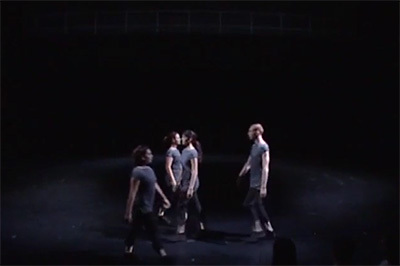 Because of the complex nature of her choreography, Childs devises methods for dancers to “reset” if they lose track of their place in the dance during performance. 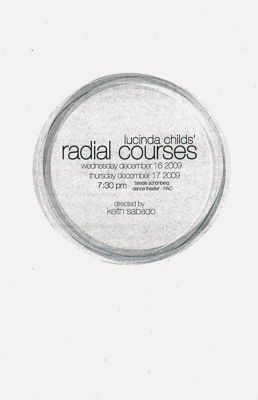 This video of Radial Courses from a performance at Sarah Lawrence College, December 2009, demonstrates such an occurrence. At the 10:58 marker, one dancer calls out the need to reset, and the place in the choreography to begin again. Recovery situations such as this are built in to the rehearsal process. 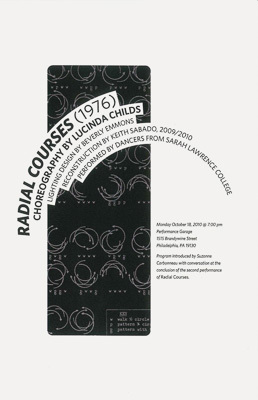 The reconstruction of Lucinda Childs’ Radial Courses (1976) at Sarah Lawrence College was made possible by “American Masterpieces: Dance,” a program of the National Endowment for the Arts, which is administered by the New England Foundation for the Arts with Dance/USA. Videotaped in performance at Harvey Lichtenstein Theater, Brooklyn Academy of Music, New York, as part of the Next Wave Festival on October 13, 2000. 2000, U.S. premiere, ca. 22 min. 1995, U.S. premiere, ca. 21 min. 1998, U.S. premiere, ca. 10 min. 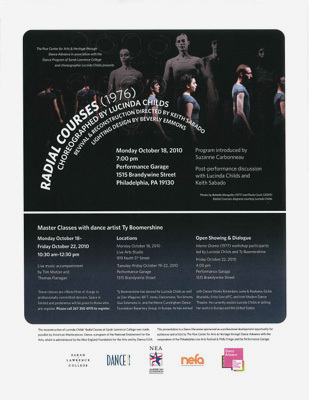 For a score of Radial Courses, see, Anne Livet, Contemporary Dance: An Anthology of Lectures, Interviews and Essays with Many of the Most Important Contemporary American Choreographers, Scholars and Critics. New York: Abbeville Press, 1978.